No it's not another Christmas card (but it won't be long ;-) ), it's new stamp time at Lost Coast Designs and Carmens Veranda. We're having a 3 day event over at the Portal To Creativity, and today it's the dressage day 2, and here's a canvas that I made. 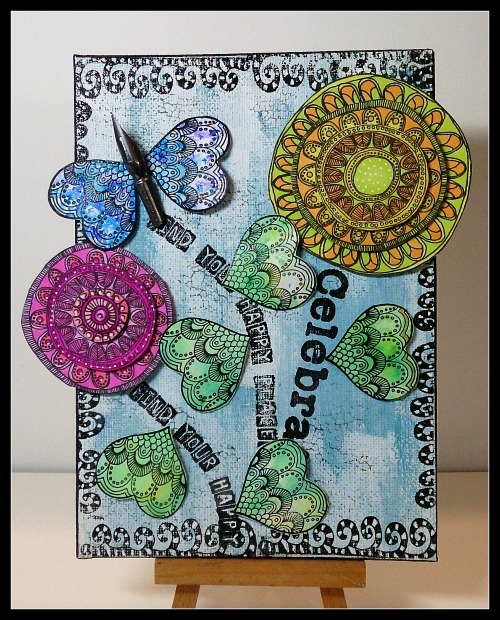 This is a mixture of Lost Coast rubber, and Carmen's Veranda clear stamps. And here are my hippy dippy cats from Day 1 using a Lost Coast moggy. Don't look at that background for too long, it will make your eyes bleed! A belated congratulations to you for joining LCD DT ! well done ! You are showcasing the stamps fabulously ! I like how you used the words as the stems. 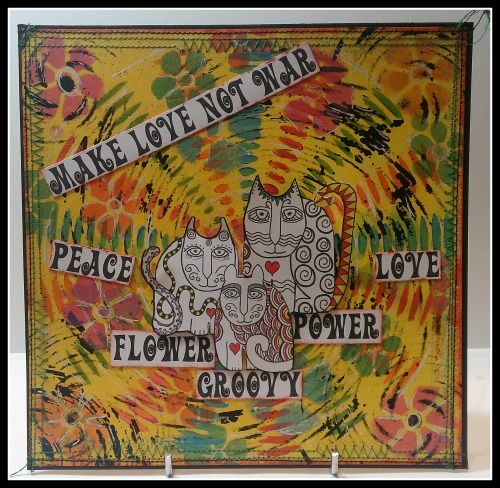 Definitely groovy - the flower power canvas is great with those amazing blooms, and I daren't look too closely at the cats' eyes... I fear they'll hypnotise me into diving into that vortex! Two great projects, Sue. Day 1, so full of energy! Day 2, so full of calm and rest. You are certainly a flexible artist! You are a wonderful addition to this DT! Gorgeous canvas anyway, I love these stunning large flowers, they pop out beautifully!!! And your clever composition with the text behind is fantastic. I love this Sue.